AgriScot chairman Robert Neill and Rural Economy Secretary Fergus Ewing. 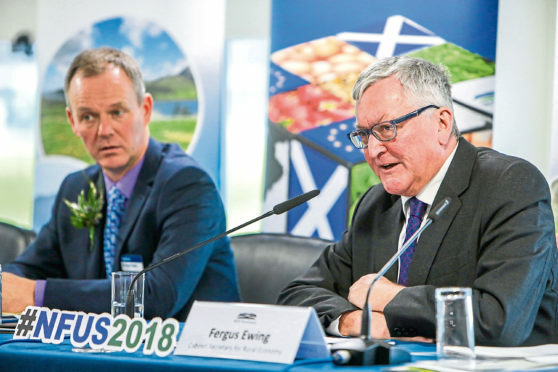 Appealing for a more liberal approach to policing any post-Brexit farm policy, NFU Scotland’s vice-president Martin Kennedy told Rural Secretary Fergus Ewing that the current system was creating health issues for farmers and dissuading them from entering the livestock industry for fear of incurring serious penalties for minor errors. He said it had reached the stage where farmers were nervous about contacting their Rural Payments and Inspections Division (RPID) area offices for help in case a call lead to an inspection. “The fear culture is terrible,” he said at the end of the event’s annual debate. “One farmer had a heart attack half way through an inspection and the family are convinced stress was a contributory factor. However Mr Kennedy said he was optimistic there would be an improvement with a post-Brexit policy. “We would still need compliance, but the vast majority of farmers and crofters toe the line 100%,” he said. Mr Ewing said he sympathised with the isolated life many farmers experience and insisted RPID staff were acutely aware of the wellbeing of farmers. Mr Ewing also announced the composition of a new simplification taskforce which will advise on making farm policy less complex. The taskforce includes Kirsten Williams from SAC Consulting and Donald MacKinnon from the Scottish Crofting Federation.